Deciding on a visual hierarchy is going to help structure your page and guide the reader's eye from one important point to the next. Margins and white space help the text breathe (and the eye & brain relax). Guidelines aren't cheating, they help keep writing even and regular. I can't stress the importance of margins and white space enough. There's just something off-putting about a busy page that is full of notes. My brain doesn't like to disentangle, it likes easy overviews. Long paragraphs get difficult to decipher after a while, and if I have to work with my handwritten notes again, I leave space between the lines, and margins for corrections and notes I might want to add when I go over them again. Divide your page into three segments - the largest one for actual note-taking, one wide enough margin to write keywords, and a space at the bottom of the page for a summary. Leave the keyword margin on the left or right hand side, whichever works better for you. I just love the option of having everything in one place, and being able to review the essentials in the summary, and quickly find a reference with the help of the keywords. Be as creative as you like. I've used a bold style in this example, and all caps, even underlining once or twice or adding starts or circles or waves around the word will make it stand out. You could use different-colored pens or circling the word, whatever appeals to you - just be consistent. 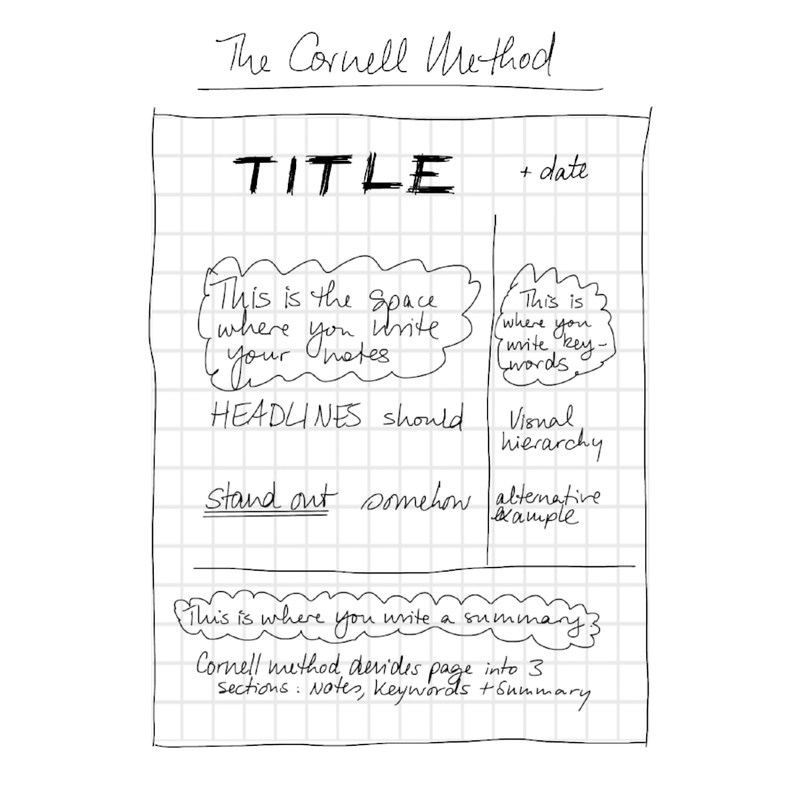 While you may not have time to write all your headlines in a bold style as you're listening to the lecture, sketch them out quickly and go back over them afterwards. For example, I might write the title in all caps and place a big dot on the side to signal this will be in TITLE style, and then go back after the lecture to add weight to the all caps to make them look bolder. Your turn - I’d love to hear from you! Do you have other tips that would make picking up a pen more enjoyable? Thanks for sharing, I really wanna know! Bonus points if you noticed that I used the visual hierarchy system for this very blog post - I know, meta, right? ;-) The title is large and bold, the headings are bigger than the body font, I added a list for easy access, and a couple doodles for visual interest. Did it work? Are you still reading this? Sweet!